Exporter of a wide range of products which include concrete brick making machine, fully automatic brick machine, fully automatic brick making machine, fully automatic multifunction brick machine, high density brick making machine and hollow brick machine. We are leading manufacturer and exporter of Fully Automatic Multifunction Brick Machine, Multifunction Block Making Machine, Block Machine, Block Making Machine, Concrete Block Machine, Hollow Block Machine, Concrete Block Making Machine, Cement Block Machine. This machine is Multifunctional, Could make All kinds of Blocks, Bricks and Pavers while change the Moulds. All in One Machine : Fly Ash Brick, Concrete Block, Interlocking Brick, Interlocking Block, Interlocking Paver etc. With the help of our experienced professionals, we are able to offer a wide range of Fully Automatic Brick Machine. To manufacture this range, our professionals make use of optimum-grade raw material in compliance with the international quality parameters. All the products are rigorously examined by our quality controllers team to ensure the flawlessness before being dispatched in the market. Our clients can avail thus range in various sizes, designs and custom-built models, to meet the variegated requirements of our clients. 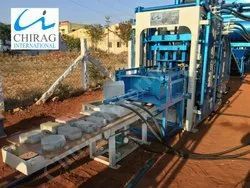 Chirag Semi Automatic Bricks Making Machine This model has been applied for the patent protected by state laws, counterfeiting is not allowed Chirag Semi Automatic Bricks Making Machine (Patent No.201220242625.7). 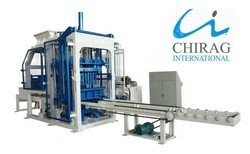 Chirag Multifunction Bricks Making Machine Compact design and Auto & semi-automatic control, with easy operation. Low investment brings you cost saving. Chirag Multifunction Bricks Making Machine Highly productive moulding device, which consists 360 rotating and compulsory feeding of raw materials, platform vibrating and compression shaping, greatly improves the cycle time. The finished blocks are of good shape and high quality. Chirag Multifunction Bricks Making Machine Our machines, with harmonic cooperation between mechanical, electrical and hydraulic machines functions, guarantees a reliable and high production output of concrete products. 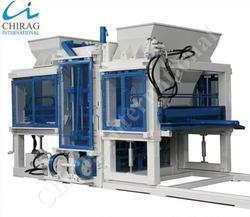 Compact design Chirag Advanced Popular Multi Material Brick Machine Low investment brings you cost saving. Highly productive moulding device, which consists 360 rotating and compulsory feeding of raw materials, platform vibrating and compression shaping, greatly improves the cycle time. The finished blocks are of good shape and high quality. Our machines, with harmonic cooperation between mechanical, electrical and hydraulic machines functions, guarantees a reliable and high production output of concrete products. 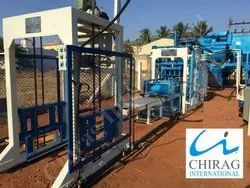 Chirag Advanced Popular Multi Material Brick Machine The moulds are changeable, and it is able to produce various kind of blocks,bricks,interlocks, pavers and kerbstones in different types, sizes, shapes, and colour layers. With face mix device, its able to produce pavers with colour layer. 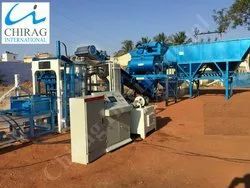 Chirag Mega Technology Brick Making Machine Unique design. The special loading and supply unit, the multi-line whipping forks are fixed at inside of material feed box. The whipping forks works and feed the material to mold box forcedly during the material feed box moves to up of mold box, the feed will smoothly and equalization, than for the product, the intensity is insured and the weight is equal. 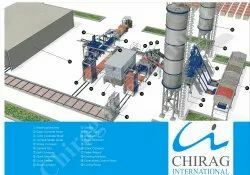 Chirag Mega Technology Brick Making Machine Design with super strong vibrating activated force, The computer controls the pressure and flowing rate of hydraulic system; vertical synchro vibration; frequency conversion; brake, final the product reaches the high density and high strength within short time. Chirag Mega Technology Brick Making Machine Multi use; strong performance; the many kind of products with difference form and size can be made when use the difference mold , such as wall block, honeycomb type block, road block and slope block. 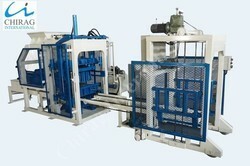 Looking for “Fully Automatic Brick Machine”?